So I had this great idea, right? The boy and I were going on vacation. We were renting a house for the week with a perfectly adequate kitchen. He loves desserts. I would use Hay Hay It’s Donna (hosted this go-round by TriniGourmet.com) Day as a good excuse to make some delicious dessert tarts for him while we’re there. Smart, huh? So…after scouring for a decadent chocolate tart recipe on our way out of town, I do a drive by at the Viking Store for a stash of little tartlet pans and… we’re off! Not so fast. Remember that thing I said about not baking? This session of HHDD reminded me why I have so much trepidation. I realize that it’s probably not cool or chic to admit that I had a _ _ _ _ _ (insert your own colorful language there) of a time with my tarts…but I’ll own up to my challenges as much as my successes. In short…the crusts hated me. Evil, hateful, meddling pastry crusts. I followed this recipe to the T…but I halved it. Was that my downfall? Was it an unfamiliar oven? Only the baking gods know for sure. All I know for sure is that it took me THREE TRIES to get pastry crusts that didn’t look like either a hockey puck…or a Barbie sized hockey puck. I can happily report that once the pastry got worked out, these were absolutely delicious. The texture of the chocolate, once it got to room temperature, was smooth and cake or brownie like. The addition of the candied grapefruit – and I love grapefruit – was such an interesting twist on the chocolate and citrus pairing. 1 . Orange is the classic choice with chocolate, but candied grapefruit peel has a little bitterness that I also enjoy. I prefer deep, strong, dark chocolate with about 70 percent cocoa—the richer the better. 2. Put 1 cup of all-purpose flour in the bowl of a food processor with 6 tablespoons of butter cut into pieces, 3 tablespoons of confectioners’ sugar and a dash of salt. Process for 15 seconds, until well mixed. In a bowl, mix 1 large egg yolk with 1 tablespoon of milk. Add to the processor bowl and process for another 15 seconds, until the dough forms a ball. Roll out the dough immediately or chill it for an hour or so before rolling. 3. Arrange ten 3-inch fluted tartlet molds on a table. Roll the dough between 2 sheets of plastic wrap to a thickness of 1/4 inch. Remove the top sheet of plastic and invert the dough over the molds. Using your fingers, press the dough through the plastic into the molds. Remove the plastic and trim the excess dough. Refrigerate for a couple of hours. Bake the tartlet shells in a preheated 350° oven for about 20 minutes until golden. Leave the oven on. 4. Meanwhile, put 5 ounces of chopped bittersweet or semisweet chocolate into a 4-cup glass measuring cup. Add 2/3 of a stick of butter cut into pieces and 2 tablespoons of sugar. Microwave for 1 minute, stir, leave for a few minutes, then microwave again for 1 minute until the chocolate has melted. In a small bowl, mix 1 whole egg and 1 egg yolk. Whisk the eggs into the chocolate. 5. Divide the chocolate mixture among the 10 tartlet shells. Bake for 5 minutes. 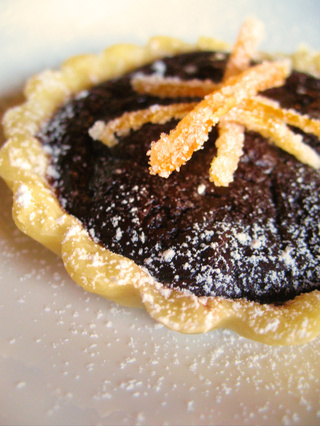 The tartlets should be eaten at room temperature, so that the chocolate filling is slightly soft and creamy. Sprinkle with confectioners’ sugar and garnish with the Candied Grapefruit Peel. NOTES: For a more brownielike texture, bake for 5 minutes more. 1. Using a vegetable peeler, remove 10 wide strips of zest from a ruby red grapefruit. (Take care to remove only the surface and not the white pith underneath.) Slice the zest into 1/4-inch-wide julienne strips. In a saucepan, cover the strips with 2 cups of water, bring to a boil and cook for 10 seconds. Drain in a strainer and rinse the strips under cold water. 2. Return the zest strips to the saucepan with 1/3 cup of sugar and 2/3 cup of water. Bring to a boil and cook, uncovered, until the mixture starts to thicken, about 8 minutes. At this point, the syrup should be a bit gooey and the zest strips should be almost transparent. 3. Spread 1/3 cup of sugar on a tray. Add the strips and toss, separating the pieces so that each strip is coated with sugar. Transfer the strips to a plate; let stand for at least half an hour, until dry. Store in the refrigerator in a jar with a tight-fitting lid. OMG, this is one wonderful tart! This looks so delicious! I totally understand the trepidation about tart crusts. That’s why I usually just buy pre-made pie crust dough from Trader Joe’s and spend all that time on the filling. I excited to try candied grapefruit peel. What a great idea. Thanks for the inspiration. I had to laugh at your story of why you don’t bake. I’m with you on that one, girl! But for some reason, tarts seem possible. Not pies, mind you, but tarts. For whatever reason, they seem to be more forgiving. And these look fabulous! Thanks so much for taking part in this month’s round of Hay Hay it’s Donna Day :) The roundup should be posted later today or tomorrow :D Stay Tuned! Tami I’m on vacation too and baked my tart in a strange kitchen. Not my best effort and I plan to try again using my chef’s torch to caramalise the top when I get home to my own kitchen. Thanks for joining HHDD again. Wow, these look delish. Congrats on winning this round of HHDD. Congrats on winning – I saw these when you posted and thought: Oooh, those are some fine looking tarts.